I have a confession for The Confessor: Geiger books now fall into the guilty pleasure category. Many thanks to Saichek Publicity for sending us a copy of Mark Allen Smith’s new novel. This novel is the sequel to Smith’s first book in the series, The Inquisitor, and I have to say that they’re a surprising amount of fun. My snark, however, softened a bit when in The Inquisitor, Geiger saves a child and spends the book protecting him. Ok – I’ll buy it. And darn it, once I got past the over-the-top torture scenes at the book’s beginning, I actually started to root for the guy. Then came the offer to read the sequel The Confessor, and I have to admit that I winced. Sure – the first book was a bit of a romp, and I enjoyed the story’s pace, but did I care enough about Geiger and his entourage to actually read the second in the series? Check out that brooding cover. Not my normal read by a long shot. This looks like a book that you’d find in the swiveling book rack at the airport. As it turns out, I’m a Geiger fan. Even more…. Mark Allen Smith is a terrific writer. No… wait. His words are actually eloquent. Not only do they keep the book going at a breakneck pace (the almost-500 page novel felt more like 100), but his imagery is extremely effective. So take THAT, airport books everywhere. The Confessor has left the rack. The Confessor picks up almost a year after The Inquisitor leaves off. Geiger, who miraculously survived the first book’s ending, is trying to keep a low profile. He has officially left the information retrieval business, and almost everyone thinks he’s dead. Geiger’s old partner Harry Boddicker can’t find him, Geiger’s grotesque rival Dalton is desperate to get his hands on him… and we get to meet Zanni Soames, who is a dangerous professional in her own right, and is trying to beat everyone to the punch. When Harry takes a job for the government and gets himself captured in Paris by the lunatic Dalton (also in IR – I’ll never look at a wasp quite the same way), it’s all eyes on the only man who can possibly save him. Ezra, the boy from the first novel returns here, which was certainly a welcome addition. Ezra always managed to cut through some of Geiger’s protective layers, and the connection between these two characters is just as touching in this novel as it was in the first. Ezra’s father Matheson was also captured by Dalton at the same time as Harry, so let’s make that a party of two that requires a rescue. Dalton wants the ultimate revenge on his old nemesis. It promises to be ugly, and Geiger knows that he must get to his enemy before Harry and Matheson are murdered. Geiger eventually accepts the job offer (which comes directly from Zanni Soames – please don’t get me started on her otherworldly “violet” eyes), and winds up with unlikely partners on his way to Paris. Who can be trusted? Who’s going to die first? And for the love of God, will Geiger ever crack a smile? I won’t tell you if Geiger smiles, but I can share that once the job is accepted, it becomes extremely difficult to put the book down. And while both novels in this series effectively lay out pretty thrilling plots, I found The Confessor to be the more mature of the two. While Geiger is still comically stoic, we finally get a better peek into his childhood, and how his upbringing created a man who was more robot than human. Everything makes more sense this time around, and seeing Geiger in this light makes his character more likable, and the story slightly more realistic. (Slightly.) As it turns out, he’s not infallible. This was refreshing. As a whole, The Confessor‘s character development was far more thorough, which put gore in the background. Yes, there were some grotesque moments, but this time, they seemed to be more about gaining character insight rather than penning what could best shock the reader. Were there moments in this novel that I could have done without? Yes, but at least I understood their presence. Beyond detailing the intricacies of Geiger’s background, we get to see more about Harry, Ezra and yes, even Dalton. I also enjoyed Zanni’s character very much. She was brutal, smart, and held her own. Quickest way to this Hoarder’s heart is to create a strong female lead. Not every hero is a brute fella. Would I recommend The Confessor? Sure I would. This novel is clever and very entertaining. If a book can sweep you into its thrilling plot, helping you to temporarily forget that the main character is borderline superhuman, then it’s a fun read. Is Geiger a realistic character? No. Would I read the next installment in this series? You bet. 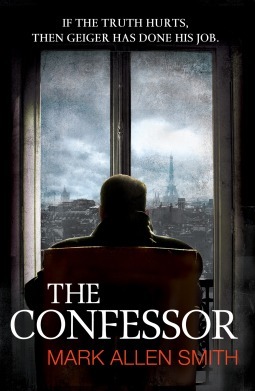 4 stars for The Confessor.